Unlike last week's featured finished edge, the selvage, which doesn't require any work and can only be used in certain situations, this finished edge is a little more flexible, but actually requires you to do some cutting and sewing. But that's what we're here for, right? On first glance a binding has a similar look to a band (or in these links, a rib band -- part 1 and part 2). I can't say whether a binding is better or faster or neater than adding a band. It's just different. What actually is the difference between "band" and "binding"? That's a tough one to write about because many people use the terms interchangeably. To add to the confusion, some people incorrectly refer to it as "ribbing"! A rib fabric ("official" fabric used in "rib bands") isn't necessary with either finishing method, but can be used with either. You can see the difference between bindings and bands. This edge is finished with a binding. The edge below is finished with a band. In the top photo, the binding encases the raw edge of the garment. In the second photo the band extends the edge of the garment. 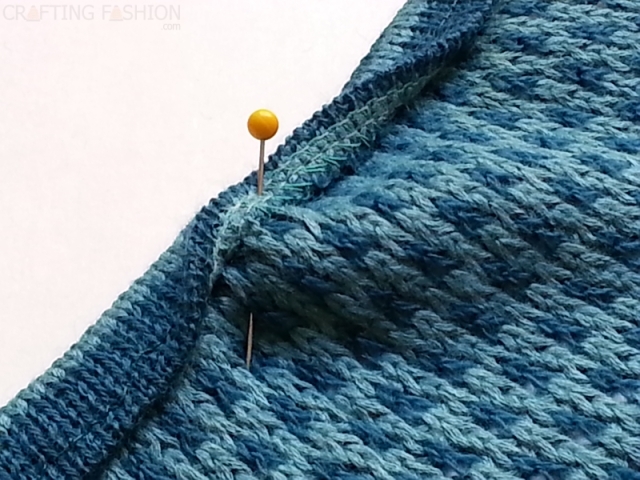 This is the time where I would ordinarily give the steps for finishing an edge with a binding, but I'm not going to do that today, because there's a good tutorial on adding bindings to knit garments over on Gorgeous Fabrics' blog. Here are my modifications. I did an additional step at the beginning, because I'm using a sweater knit fabric, rather than a lightweight knit, and I didn't want to leave the inside edge of my binding raw. I serged and pressed under one raw edge of the binding fabric before sewing the opposite edge to the garment. Peeking under the inside edge of the binding, it looks like this -- no raw edges. 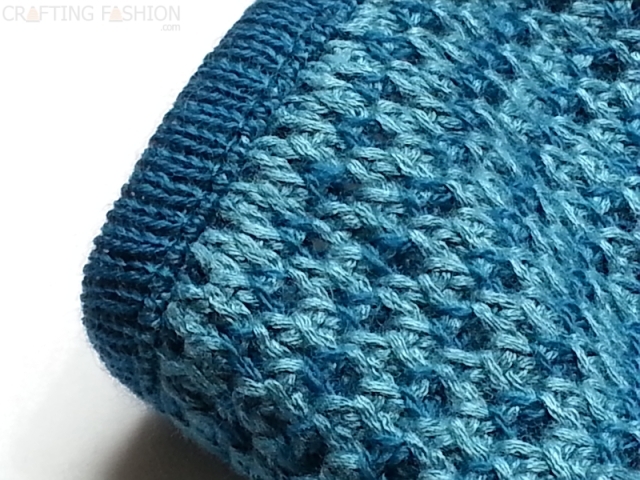 My other modification was to use a wobble stitch when doing the top stitching. 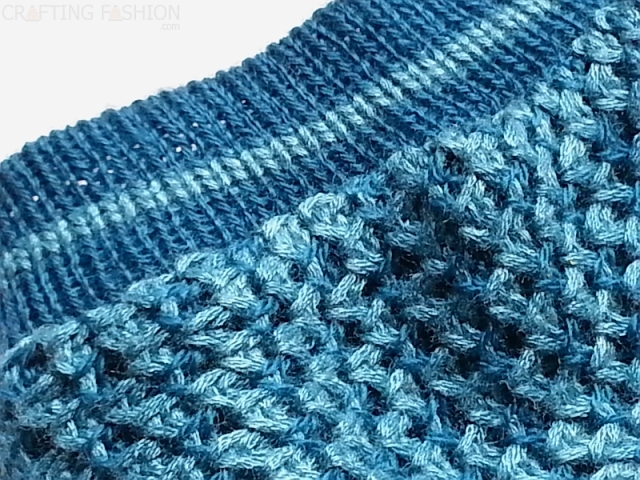 A wobble stitch is a very narrow zigzag, in this case, 0.75 mm in width. With this weight of fabric it's hard to see the wobble at all in the top photo, but using it provides a nice bit of stretch. It's always nice to have another way to finish an edge. I don't recommend bindings on extra bulky fabrics, however. It'll be easier to add a band in that situation.